BODMIN BROUGHS break World record price for a British Motor Cycle at auction in Stafford in April 2016. 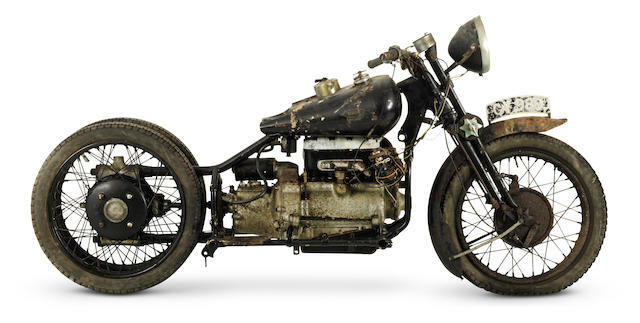 "This is one of the greatest motorcycle discoveries of recent times," said Ben Walker, international director for Bonhamâ€™s Collectors' Motorcycle Department. "A lot of mystery surrounds these motorcycles, as very few people knew that they still existed, many believing them to be an urban myth. There was a theory that they still existed somewhere in the West country, but few knew where, until now." Stored in barns for more than 50 years, the motorcycles were discovered whole, in parts, and some were partially submerged under decades of dust, old machinery parts and household clutter. They belonged to the late Frank Vague, who was an avid member of the Brough Superior Club. He acquired the majority of the collection in the early 1960s. Brough Superior motorcycles are rare, powerful machines of the pre-war era. Dubbed the Rolls-Royce of motorcycles, they're famed as the bike of choice for aficionados such as the playwright George Bernard Shaw, and T.E. Lawrence, aka Lawrence of Arabia, owner of eight models. Brough Motor Cycles were made in Nottingham and the Industrial Museum in Nottingham display several items connected with the firm.